Lucky Scooters has been making scooter wheels since 2009, which is when we released our wheel video to promote the new product. At the time, we had thought that we hit the nail on the head in terms of urethane compound, core design and colorway options. However, what we didn't know was that there is a lot more that goes into making a high quality scooter wheel then just throwing it together and having it manufactured. Here is the wheel video for those of you who have never had a chance to see it. It features riders such as myself, James Gee and other original Lucky team riders. Anyways, as the industry grew and progressed, more and more scooter companies began to produce higher quality wheels and each product brought something different to the table. As that began to occur, the demand for Lucky to produce a higher quality wheel became apparent. Lucky spent a lot of time trying to nail down the proper urethane compound (not too soft/ grippy, not too hard/ slippery) because the urethane is essentially what determines the quality of the wheel. Finally, after much deliberation, the new line of 2014 Lucky wheels is about to hit the market, and boy are they going to make a splash. These wheels have an all new urethane compound that has been tested and is destined to out perform any competitor. 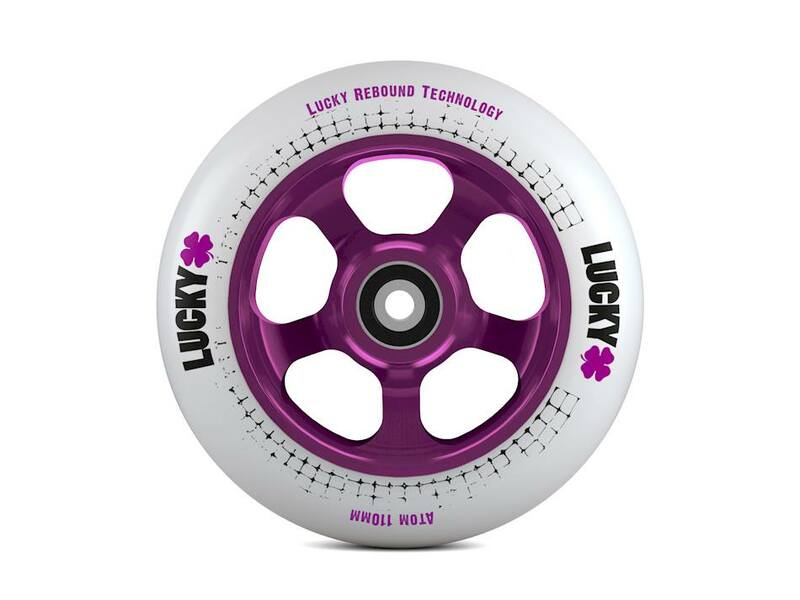 The 2014 Atom wheels, as well as Lucky's new line of Lucky 10 wheels (10 spoke), will be equipped with this higher quality urethane compound and all new colorway options for anyone out there who wants to ride some radical, new colors. All I can say is, we are all in for a treat when Lucky's 2014 line of wheels are released so keep your eyes peeled and your pennys saved. The Atom wheels will be selling for the low price of $34.95! If you haven't already, be sure to get some bearings for your wheels!